The Holiday Market has been tailored to help local entrepreneurs to promote their products and services and to provide community members the opportunity to shop local for the holiday season. 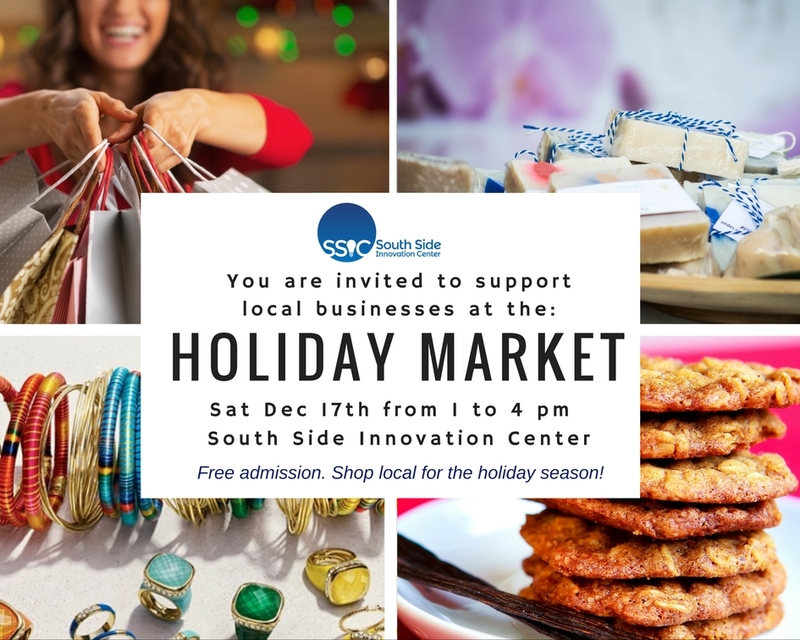 On Saturday, Dec. 17th the SSIC will be hosting its annual Holiday Market featuring food entrepreneurs and artisan makers who will be sampling, showcasing and selling their products. We’ll be adding a list of event vendors soon – stay tuned! If you’re interested in participating as a vendor at this event, the cost to set up an exhibit table is $25. To register as a vendor, please reach out to Samantha Brennan at sbrennan@syr.edu or by calling (315) 443-8466. This event is free to attend and open to the general public. RSVP for your free ticket today and plan on stopping by between the hours of 1 and 4 p.m. on Dec. 17th. Event parking is available at no charge at the South Side Innovation Center, which shares a parking lot with Dunk and Bright Furniture. We’re located at 2610 S. Salina Street in Syracuse.